SandTrack™ is a software application that provides data management for fracturing sand facilities. It provides Inventory and Activity tracking for hydraulic fracturing sand storage and distribution facilities. It can also be used with any other types of sand distribution facilities. It integrates seamlessly with a Sterling Systems’ control system to provide data management and historical data logging for activities that occur through the control system. An optional Data Import/Export module can be included to provide a bridge between third party truck or railcar system, and the Sterling’ control system. This allows truck and railcar tickets to be imported from the third party system, serviced by the control system, and exported back to the third party system. SandTrack inventory data management for fracturing sand facilities application provides data management, historical data logging, ticket printing, management reports, and bridging between the aforementioned third-party and Sterling’ systems and the Sterling’ WebCentral™ remote supervisory application, as well as any remote Corporate Network and ERP system. Set the types of sand present within the system; “Sand Types” (establish Sand Type Code, Description, Bulk Density and the beginning Total Inventory in the system). Establish a list of truck drivers and setup each; “Drivers” (Driver ID, Last Name, First Name, Employer and Phone Number). Contact Name / Phone, Address 1 and 2 / City / State / Zip, Directions). Define the storage location for the Sand Types; “Silo Assignment” (Silo ID, Silo Name, Type of storage, Sand Type / Description / Capacity, and much more). Schedule each railcar currently onsite; “Railcar Sched” (Track, Railcar ID, Sand Type, Vendor, and more). 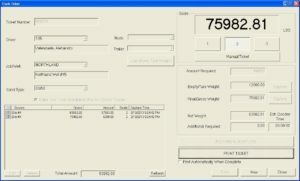 Create Truck Tickets, view and print; “Truck Tickets” (Ticket ID, Driver ID, Truck ID, Driver Name, Job/Well, Sand Type, and more). Display a log of all transfer data that has been uploaded from the Control System; “Railcar History” (Start / End Time, Railcar ID, Start / End Inventory, Vendor ID, Start / End Inventory and more). SandTrack provides numerous data screens for setup and data display of Railcars, Trucks, Drivers, Silos, Truck Tickets, Jobs and more. Desktop PC running Win 7 Pro or Win 10 Pro. Resides on same network as the control system and any 3rd party systems. Intel Core i5 Processor or higher. Minimum 4GB RAM, 8GB Recommended. Minimum 250GB Hard Drive Space. Recommend Dual Displays if used on same PC with HMI application. Recommended 2 Network Adapters (1 for Corporate Network, 1 for Control Network.